Although featured in many works, rugby football has never reached the same level of recognition as other sports. Rugby was introduced in Japan in the 1890s, when the country was going through a protracted period of cultural and technological change that included sports and literature. Such western sports as basketball, gymnastics, golf, athletics and rowing quickly joined traditional Japanese martial arts, which up to that time had been the main physical exercise of the samurai elite. The most successful import was baseball, which arrived as early as 1872. However, despite its popularity the American sport was heavily criticised by part of the Japanese intelligentsia for lacking in self-sacrifice and discipline while at the same time promoting such despicable acts as “stealing bases”. In 1911, for instance, the Asahi Shimbun, a leading Japanese newspaper, published negative comments by Nitobe Inazo, a prominent intellectual who had authored Bushido: The Soul of Japan (and whose bespectacled effigy would be featured on the 5000-yen note between 1984 and 2007). Apparently, Nitobe likened baseball to picking a pocket and deceiving your opponent – clearly not something a samurai would ever do. While baseball divided public opinion, everybody seemed to agree that rugby promoted self-discipline, courage and a spirit of sacrifice. For several years, the Japanese had been frantically translating and reading foreign books of any kind, eager to learn from, and close the cultural and technological gap with the West. So the next natural step in promoting rugby around the country was to publish, in 1899, an abridged edition of Tom Brown’s School Days, a novel written in 1857 by Thomas Hughes and set at Rugby School. The book – a tale of Tom’s school life – contains an account of the game of rugby and quickly became the most popular textbook of English-language origin for high-school students during the Meiji Period. The very first actual Japanese book on the game of rugby, Ragubi Shiki Futtoboru (Rugby-Style Football), was published a few years later in 1909, a digital copy of which can be accessed online at the Japan’s National Diet Library. 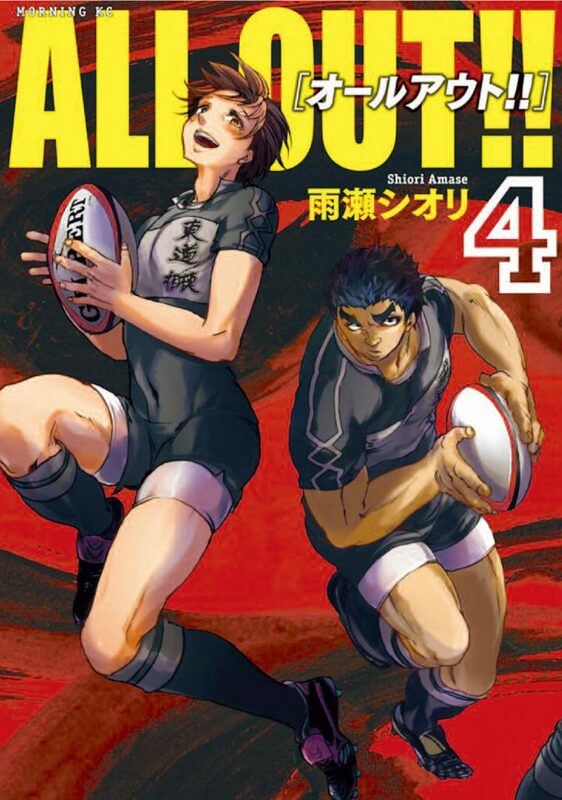 Again, the book insists on rugby’s superiority over baseball and goes so far as to quote Hashido Shin, a famous baseball player who declares that in the future he “will play rugby instead of baseball”. Mishima Yukio is probably the most famous author who wrote about rugby. He actually even tried his hand at the sport when he attended Gakushuin (a prestigious Tokyo school, which counts most of the members of the Imperial Family among its former or present students) and briefly joined its rugby club. That experience ended up in failure, and Mishima eventually abandoned team sports and took up kendo and bodybuilding, but rugby was later featured in the semi-autobiographical Tabako (Cigarettes), a short story about a sensitive boy who is the victim of a rough, brutal and bullying rugby club. The piece was first published in Ningenmagazine PoPulaR cultuRE could do better Although featured in many works, rugby football has never reached the same level of recognition as other sports. in 1946, on the recommendation of future Nobel Prize winner Kawabata Yasunari, and constitutes Mishima’s debut in the literary world. Another high profile Japanese author with a rugby connection is Shimada Soji, who is often referred to by his fans in Japan as the God of Mystery as he reinvented and popularised classic whodunit-style novels and helped establish a new modern detective fiction genre, known as shin-honkaku (new orthodox or new classical detective novels), which features Sherlock Holmesstyle deduction, reason and logic. Shimada, in contrast to Mishima, had a positive rugby experience (he played right wing in his high school team), and the sport is often featured in his novels. For example, his tough no-nonsense detective Yoshiki Takeshi – the main character in one of his two major series – is a former rugby player. The 14-book Yoshiki series was so successful that it was adapted for television, making the rugby-loving detective a household figure. Japan’s best-known rugby writer is Baba Nobuhiro, whose debut novel in 1981, Ochikobore Gundan no Kiseki (Miracle of the Dropout Group), was based on the true-life story of a former Japanese international rugby player who becomes a teacher and coach at a failing high school in Kyoto. The school is plagued by delinquency, and things start badly when the team is thoroughly beaten on its first outing, but the protagonists convince a local hooligan to join. The team eventually goes on to win the Kyoto Prefecture Rugby Tournament, turning around the fortunes of the failing school in the process. The rags-to-riches story struck a chord with readers, who could undoubtedly relate to the familiar themes of teamwork, sacrifice, and how belonging to a group can turn everyone into winners. The story’s success was further reinforced in 1984 when the novel was adapted into a 26- part TV drama called School Wars – that some people still consider Japan’s best television series ever – while a feature film, School Wars Hero, followed in 2004, portraying the underdog team’s improbable journey to success and their appearance at the sacred Hanazono ground, the location of the annual finals of the All Japan High School Rugby Tournament. Both the drama and film’s popularity were greatly helped by their high-octane uplifting theme song, Holding Out for a Hero. Originally performed by Bonnie Tyler in the 1984 Hollywood blockbuster Footloose, its Japanese version was sung by Asakura Miki. Comics would seem to be the perfect medium to express rugby’s blood, sweat and tears mentality. However, for many years, rugby manga have been easily outperformed by other genres, be it football (Captain Tsubasa), volleyball (Attack No.1), baseball (Star of the Giants and Major) or judo (Yawara!). After all, the above mentioned sports are either incredibly popular or have earned Japan lots of Olympic gold medals and world championships. In comparison, not only has rugby traditionally been considered a sort of elite sport (some of the strongest amateur teams belong to elite private universities such as Keio and Waseda) but also until very recently it was seen as unpopular. Since 1978, no less than 25 manga have been devoted to this sport, but only a few of them have lasted for more than a couple of years. Kobayashi Makoto’s pioneering 1-2 no Sanshiro (1978-83) was a reasonably popular series (it was awarded the prestigious Kodansha Prize in 1981, and was even adapted into a film), while Kujirai Ikuko’s Madonna (1987-92) was collected together in 22 volumes and was followed by two straight-to-video films. This latter manga was probably inspired by School Wars as it tells the story of a female teacher who is in charge of a high school class full of problem students and gets involved with managing the school’s rugby club. Unfortunately, these two works were followed by a string of titles (Hard Tackle, Gain, Upset 15, etc.) that failed to impress comic magazine readers. However, the national team’s impressive performance at the 2015 World Cup and in recent test matches seems to have had a positive effect. Three more manga have had short runs in the last three years (Fullback, Full Drum, and Bull Tackle), but the most popular work by far has been All Out!! Created in 2013 by female artist Amase Shiori, this manga is still being serialised in Kodansha’s Monthly Morning Two. The title refers to full-on, no-holds-barred rugby. Indeed, this comic, despite being written by a woman, is a typical story of friendship and male bonding, and is proving to be so popular that in 2016 an anime series was aired on TV. It remains to be seen if next year’s World Cup will further increase popular culture’s interest in this sport.